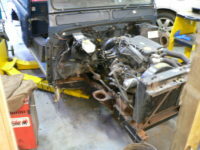 For the last year we’ve been slowly restoring a 1994 Land Rover Defender 90 and recording the process step by step. To start with we were aware that the Chassis had been suffering with rust underneath the Crossmember and along the Outriggers, so we knew we had to fix this to ensure the car would survive many more years. This means we had to take the engine and body off of the chassis, so that we could treat the entire thing for rust also, however this was building into a large job.